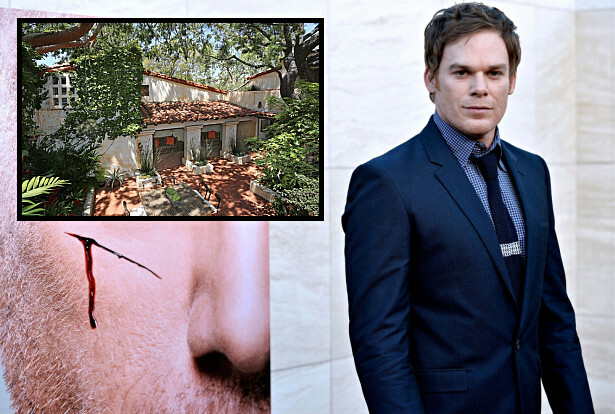 via The Wall Street Journal: Michael C. Hall has put his compound in Los Angeles on the market for $2.35 million, according to his agent Josh Myler of the Agency in Beverly Hills. The roughly 4,600-square-foot, Spanish Hacienda-style house was built in 1926 at the end of a cul-de-sac in the Hollywood Hills. It has four bedrooms and five bathrooms. The home has a courtyard garden off the living room as well as a library, media room, separate den off the kitchen, formal dining room and a wine room. An additional patio and garden area connect the main house to a one-bedroom, one-bathroom guest home. There’s also a three-car garage on the property. British actor Ronald Colman, who was a Hollywood movie star in the 1930s and 1940s, was among the first owners of the home, which is why the property is known as the Ronald Colman Estate. Hall bought the home last year for $1.95 million, according to public records. He relandscaped much of the 0.3-acre property and renovated some of the interiors as well. Hall is now selling because he recently bought another house in Los Angeles, says Mr. Myler. “Upon first stepping into the residence, I felt transported to an old-world oasis,” says Mr. Hall. Mr. Myler shares the listing with Jeff Kohl, also of the Agency.